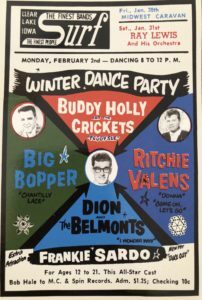 February 3, 2019 – LA Kelley Communications, Inc.
Today is the 60th anniversary of what was dubbed “The Day the Music Died,” by singer Don McClean in the song “American Pie.” The day that singer Buddy Holly, Ritchie Valens and The Big Bopper died in a plane crash in an Iowa cornfield at 1 am on a frigid morning, after performing at the Surf Ballroom. 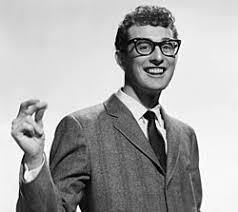 Besides the song immortalizing the young men, the movie “The Buddy Holly Story” commemorates the life of Buddy Holly, who was surely one of the most amazing and talented rising stars in his time. Great movie, with Buddy Holly spectacularly played by actor Gary Busey. 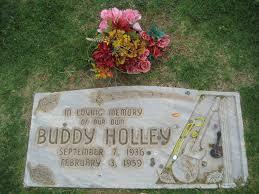 I recently watched the movie, and then read a biography on Buddy. He is undoubtedly one of my favorite musicians in rock. His talent cannot be overstated. When he died at age 22 in the crash, he was already a global sensation. He wrote and performed 50 songs, with the blockbuster “Peggy Sue” often dubbed as one of rock’s great songs. (In 1999, the song made it on the NPR 100, a list of the 100 Most Important American Musical Works of the 20th Century”) Buddy traveled the world, visiting Australia and England, where he was revered. When he performed in England, a 15-year-old Bob Dylan watched him in awe from the audience, as did a young group called the Quarrymen (later The Beatles). They were mesmerized that someone like them—a young man— could make it so big. That he wrote his own songs (singers and performers usually didn’t do that then; Elvis sure didn’t). That he started getting into production of his music. That he couldn’t even read music! His talents were natural and sharp. He created a new genre—rockabilly, combining the country-western style of his home state Texas with leading edge rock and roll. Holly went on to inspire musicians for years and decades after his death. When you think of his brief life, and realize there was an amazingly small window of only 18 months from when he emerged on the music scene till his death, it’s absolutely incredible what he accomplished. And he was mentoring a young and struggling musician named Waylon Jennings, who was performing with them the night of the crash. Waylon gave up his seat to the Big Bopper (J.P. Richardson), who was suffering from the flu. None of the young men wanted to travel in the old school bus that kept breaking down, with no heat, another 10 hours to Minneapolis in the cold. Buddy chartered the plane. Waylon would suffer survivor guilt for years afterwards. The plane crashed within minutes of take off at 1 am. All four people on board were killed instantly. The movie, often dubbed “The Buddy Hollywood Story,” is not terribly accurate. Paul McCartney, a huge fan, made a documentary about Buddy Holly, after the first movie, to set the record straight. (And he bought the entire catalogue of Buddy Holly songs.) Unlike how he is portrayed in the movie, Buddy wasn’t arrogant, never tried to punch anyone. As a Texan Baptist he was polite, and incredibly creative. What does all this have to do with hemophilia? Nothing, except our community has so many young talented musicians, waiting for their chance. 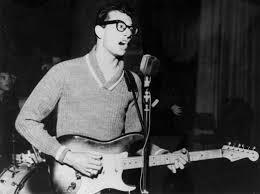 Buddy’s story is inspiring—I highly recommend reading Buddy Holly: A Biography by Ellis Amburn. And listen to his music: it’s magical, uplifting, clever, innovative. Buddy made it cool to wear glasses (John Lennon, very visually challenged, took to wearing his specs on stage after seeing Buddy). Buddy made it cool to look like a geek and be a star. He never doubted himself a second, and I hope our young stars never do either. 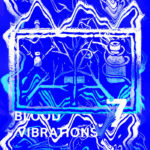 Dust off your guitar and send your music to Blood Vibrations (https://bloodvibrations.bandcamp.com/), a group from our community, which will promote your music on their website and in their album. They’re waiting for you.